This webinar introduces participants to a typical supplier’s journey in social compliance and provides practical tips from getting started to moving beyond compliance. 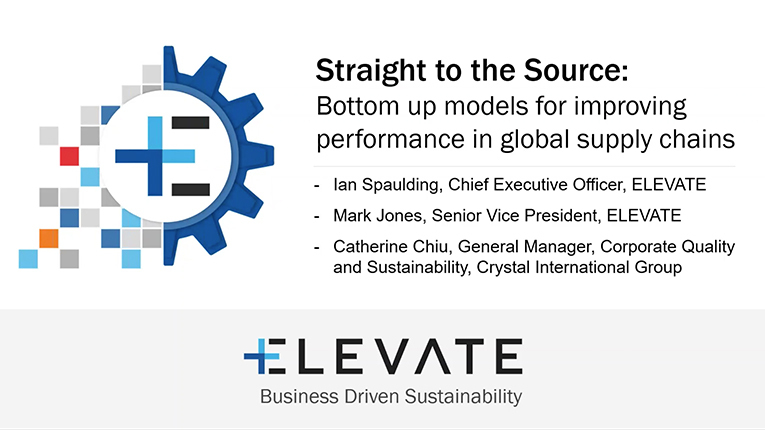 Rather than a presentation, we are offering a practitioner’s perspective from a supplier in discussion with ELEVATE’s CEO, Ian Spaulding, and SVP Mark Jones. We know that companies can struggle to figure out ways of moving ideas for beyond audit alternatives forward in their organization. Join us in this webinar and we’ll give you a pragmatic, practical outlook that says “I can do this”. Ian and Mark are joined by Catherine Chiu, General Manager of Corporate Quality and Sustainability at Crystal International Group, a global leader in the apparel manufacturing industry that runs 20 self-operating manufacturing facilities in China, Vietnam, Cambodia, Bangladesh and Sri Lanka. In 2016, the Group ranked first by production volume, with 7 out of the top 10 global leading brand apparel companies as its customers.